John Martin will be embark on a UK tour with his quintet in June – August 2016. 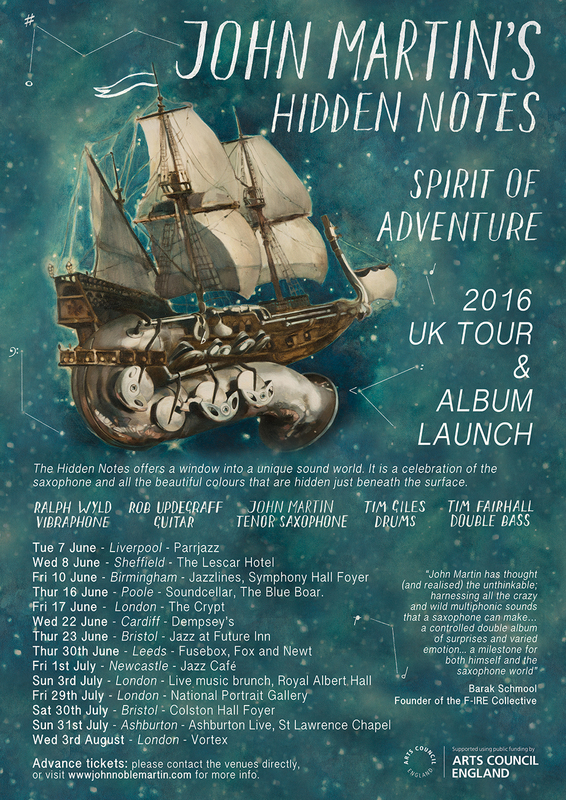 This will coincide with the launch of his forth coming album “The Hidden Notes, Spirit Of Adventure” which will be released on the F-ire label on the 10th of June. The album will be available as a double CD digipack and digital download from this website and all good record outlets. A wonderful painting of a saxophone ship has been commissioned to represent the journey of this project, which may also be available as prints in the near future. Hope to see you at one of our upcoming gigs!. The Hidden Notes gratefully acknowledges the support of the Arts Council of England.